Save space with DIY Vertical Gardens | The garden! Whether you are an apartment dweller, have a small back yard or just want to maximise your growing space, vertical gardens are both beautiful and practical. And did we mention that they’re easy on your back? 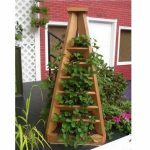 Vertical gardens also tend to get less weeds and they can usually be maintained without getting down on your knees or having to stoop for long periods. They are also very water efficient since you water at the top and moisture then works it’s way down. For that reason, it pays to put your water greedy plants at the top and the more tolerant ones at the bottom.